Definition: The practice of understanding, developing, and deploying people and their skills. Well-implemented skills management should identify the skills that job roles require, the skills of individual employees, and any gap between the two. Skills are usually defined in a skills matrix consisting of a list of skills, a grading system, and what it means to be at a particular level for a skill. To be useful, skills management must be an ongoing process where skills are regularly assessed. 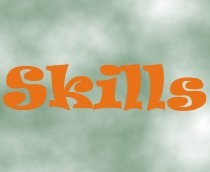 The ability to review the list of skills they require, the skills they have obtained, and ultimately their skill gaps. A development plan may be provided to bridge skill gaps over a period of time. Employees gain from improved identification and understanding of their own strengths and weaknesses, from being able to set personal goals, and to understand the value they bring to the organization, which in turn can boost morale. Enables knowledge of employee skill strengths and weaknesses. Allows them to search for employees with specific skills. Executives – A rolled up view of skills and skill gaps across an organization can enable its executives to see areas of skill strength and weakness. This enables them to plan for the future against the current and future abilities of staff, as well as to prioritize areas for skills development. These benefits actually closely match with the points I made in my last posting about the “Benefits of a Skill-Centric Learning Management System.” I guess that’s not too surprising though since the whole point of a Skill-Centric management system is to manage employee skills!